How communicators can drive innovation - Eloquor Consulting Inc.
As a communicator, are you really involved in innovation in your organization? Why or why not? If not, what are you doing about that? Not to mention these crucial questions: What does innovation really mean for your organization? Is it about patents, product improvements, or streamlining customer contacts to improve customer satisfaction? Or, is innovation about a fundamental shift in how and what your company delivers? He also talks about the fact that we innovate for other humans; an empathetic behavior he views as most valuable in the future work environment. I agree with that too, but, let’s focus on the idea of fabulous innovation as a group practice and the role of the communicator. What is a communicator to do? How can communicators enable people to collaborate and communicate effectively? What tools can we use? Which champions can we engage? 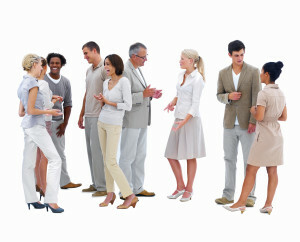 Communicators cannot simply wait around for someone to invite them. We must step out, start things, invite ourselves and engage others. It’s not enough to just wait for someone else to make it happen. We can make it happen and we should. First, communicators can facilitate contacts. We can bring people together to share ideas, to converse, to brainstorm. We don’t have to be experts; we just have to take the lead in making the time together happen. Innovation can come from anywhere in our organizations, so we need to think creatively about how we connect people. For example, I am planning a leadership retreat for a client. During last year’s retreat I was struck that the CEO’s assistant didn’t participate in any retreat exercises. This year I’m recommending she be fully engaged in the retreat. She can be an important connector for the directors and VPs, so they need to get to know her and she needs to know them. Second, communicators can creatively leverage technology to bridge gaps in time and location, connecting people who wouldn’t otherwise connect. But, there are implications. Colvin talks about technology reducing our direct human interaction, creating a decline in valuable interpersonal skills. More on this in a separate post for ALI. Third, communicators can bring the stories about collaboration and the innovation that results from it. For example, storytelling is key to my role as a consultant. Clients listen more and see themselves in the stories; it’s more impactful than telling a client what to do. When I teach at conferences and workshops, I tell stories to reinforce strategic decision-making. Fourth, communicators can be innovator identifiers. We can observe and surface the talent, the people and teams in the organization who have a knack for great ideas. Sure, leaders at all levels should also be on the lookout, but communicators come into contact with a lot of different people inside and outside the organization. We can help make innovation part of the language of the organization. Want a chance to hear more from Geoff Colvin first hand? Join me in #NOLA at the IABC World Conference where Colvin will keynote. Meantime, check out his book Humans are Underrated. If you want to explore how we can better leverage technology to bridge those gaps I mentioned above, join me in April in Chicago where I’ll be chairing ALI’s SharePoint for Internal Communications conference.